What's your digital business advantage? Do you even have one? Have you been trying to make sense of all things digital and how they fit together properly to transform and grow your business? Whether you are an entrepreneur, a corporate marketing leader, or a CMO or CDO looking for a better way to create transformation across your digital ecosystem, #Breakthrough will provide you the clear guidance for creating your digital business advantage with usable and practical insights on strategic digital marketing, digital workflows and the disciplines of digital leadership. Many businesses and entrepreneurs have lost the real focus on what is really important about their business online. They're uncertain about how to create influence and how to deliver their unique brand value. Do you know what to do "next," online, to propel your business forward, or are you flying by the seat of your pants? 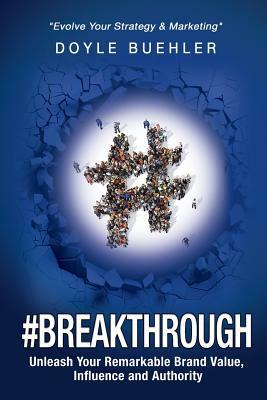 #Breakthrough is for business innovators that want to transform and organize their business. It positions these digital leaders to think in a clearer, logical, more strategic manner for moving their business forward. How do you create influence online? How can you get a thriving audience base and more leads and sales from your online efforts? It's not just about your website, traffic, or your followers. And no, it's not just about being on Facebook and running some ads, either, nor "engaging" social selling. Businesses that don't transform how they operate in the online world will suffer and fail by not knowing how to create influence nor how to deliver their unique brand value to their audience. And, they will suffer because they don't know specifically how to generate sales, leads, or ROI. Digital is often thought of as a random afterthought to a business, yet it is the core principles of how business actually gets done today; few are thinking forward with a clear strategy and method of implementation. #Breakthrough is about understanding the principles of digital leadership, creating your ideal digital strategy, and developing a digital workflow for the next step in a digital transformation of your business, to deliver your remarkable brand value to your audience. Creating a compelling digital strategy that will answer the fundamental question of 'why', and how you will actually deliver your remarkable value online. Getting clarity on where you stand right now within the complex digital environment, and what you need to do to transform and improve. Defining what is really important about online strategic marketing specifically for your business, and how to properly leverage it for your unique audience. Building a reliable, strong, stable and superior platform and workflow for your own digital ecosystem, by utilizing a simple process and methodology. Moving your business from a simple transactional foundation to a transformational value offering that builds your digital authority. This is where your digital business advantage starts, to create your transformation.